Gallifrey is located in the constellation of Kasterborus at galactic coordinates ten-zero-eleven-zero-zero by zero-two from galactic zero center, some 250 million light years away from Earth. It is the home of the Time Lords. From orbit, Gallifrey is the color of rust with brown lakes and dust-grey clouds. There are three small oceans, which were once quite large, and several seas, but less then half its surface is water. At night and day, the sky is burnt orange and often filled with purple, green, and yellow lights. Gallifrey is in the heart of the Minyan constellation of Kasterborus, also known as the Kasterborus sector. The constellation of Kasterborus is located at the center or the edge of the Mutter's Stellian Spiral Galaxy, the Milky Way on the edge of the Capricorn tract in the Sagittarius constellation, center of the galaxy. In the Earth skies, the Kasterborus ice ring and Kasterborus Borealis are in the same sector as Gallifrey's system. The Gallifrey system has six planets: Gallifrey, Karn, a frozen gas giant named Polarfrey, Kasterborus the Fibster, an asteroid, and another unknown planet, possibly Demos. 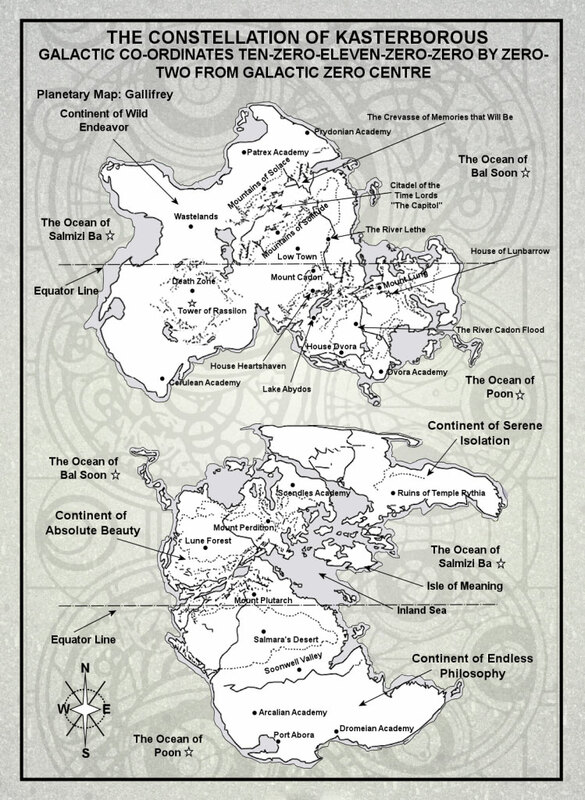 Gallifrey and Karn are the second and third planets in the system. Karn is located a few billion miles from Gallifrey and appears to have a population of no more then a few million. Gallifrey's gravity orbital, radius, star, type, pressure, temperature, and oxygen levels, are the same as Earth. As Gallifrey appears to have the same orbit as Alzarius, it might be drawn farther from the sun every 50 years by other planets in the system. Gallifrey's natural satellite, it orbits Gallifrey every 27 days. It exerts a much stronger tidal force on the planet than the Moon does on Earth. In ancient times, it was known as the virgin moon goddess. It is copper or ivory or heileotrope colored, and shines even in the sunlight. This moon has a large supply of taranium, which was mined during the Dark Time. There are also several artificial satellites that can be seen from the surface, even during the day. Millions of years after the installation of the Eye of Harmony, very little of Gallifrey's original biosphere survives. Gallifrey has more then 24 seasons--but they are similar and dry enough that many claim Gallifrey has no seasons at all. The planet is currently in the midst of an ice age, but in the summer Gallifrey's sun is still intense enough to cause sunburn on a Human. Despite the ice age, Gallifrey's ice caps are quite tiny, probably due to the overall lack of water. Although southern Gallifrey is considered quite wild and beautiful, most of the planet is burnt red deserts with orange sand and mountains. There are some green forests and golden fields strewn with ruble--but they make up a minority of the terrain. Gallifrey's highest mountain is Mount Cadon, from which flows the river Cadonflood. This snow topped gray-green mountain extends to the fringes of Gallifrey's atmosphere, and is located within visual sight of the capitol. The capitol used to have a harbor, however, many of the river beds are dry. The Prydon Time Academy is open to the air, a self-contained city annexed to the capitol and located on the slopes of Mount Cadon. The river Lethe is located within walking distance of Mount Cadon. Another important mountain is Mount Plutarch, which is near the Lune forest and the inland sea. Mount Lung is located in southern Gallifrey. The river Cadonflood is located near Lungbarrow. The Soonwell Valley is 500 leagues/3000 km from the capitol. Lake Abydos is near House Dvora. Gallifrey is also the name of its major city, the citadel which holds the capitol of the Time Lords. The capitol is also known as the Panopticon, under which the Eye of Harmony, the nucleus of a black hole, is kept. The Eye provides the power required for time travel, and all Time Lord TARDISes draw their power from it. Also situated in the capitol is the Matrix, the vast extradimensional computer network which acts as the repository of all Time Lord knowledge, as well as containing the memories of dead Time Lords. Outside the city lie wastelands where outsiders (Time Lords who have dropped out of Time Lord society) live in less technological, tribal communities. The wastes of Gallifrey include the death zone, an area that was used as a gladiatorial arena by the first Time Lords, pitting various species kidnapped from their respective time zones against each other, although Daleks and Cybermen were considered too dangerous to use. Inside the death zone stands the tomb of Rassilon, the founder of Time Lord society. Time Lords never venture into the wilderness of outer Gallifrey. The capitol's real name might be Gallifrey, but to avoid confusion with the planet's name, it is always called the capitol. The capitol is in the northern hemisphere and sits above a volcanic chasm known as the Crevasse of Memories that Will Be. The capitol once had a harbor. Its population is at least several thousand, and it has the largest concentration of Gallifreyans on the planet. A large dome covers the capitol. The capitol smells of cloisters, libraries, vellum, and old exitonic circuitry. In the center of the capitol, beneath the apex of the dome, is a turquoise colored hour glass shaped structure known as the Citadel. Rassilon designed the fortress like Citadel, and this is where all the Time Lords live. Though it towers over the other buildings, its exterior isn't large enough to allow 1,000 Time Lords to live in comfort. Its interior is dimensionaly trancendental, and has at least 119 levels. The Citadel houses the Panopticon, which holds the power mast of the Eye of Harmony and the Panopticon archives. There are 363 white towers arrayed in a circle around the presidential wheel, a famously effective polygonal. Zero room can be found in the basement of the junior senate block the chanceller guard work in. The Jasdisary building, 90 stories tall, rotates every 58 minutes, and is attached to the Citadel. Within the Citadel's Jasdisary building is the security compound, where the Oubliette suites are located the luxurious Oubliette suites are where prisoners are held if they aren't sent to Shada. A small conventional spaceport can be found near the Citadel. Scientific research is done in the Penansulix Scientific structure. The Parachronistic Chamber, located deep in the capitol, can regulate time distortions. There are two huge towers in the north of the capitol, named Canoncity and Likelihood. Both of these building are dimensionally trancendental. The Tower of Likelihood might be home to the Bureau of Possible Events. Other buildings include the multidimensional art gallery, retro-engineered spare-body-parts repository, Bureau of Political Advancement, the temple of capitol guilds, and the Office of Public Registry. Only a few of the buildings in the capitol are dimensionally trancendental. The streets of the capitol are patrolled by cleaning machines, including automated street cleaning mechanisms. Council members use aircars to get around the capitol. There is a multi-dimensional art gallery beneath the capitol. Beneath the upper levels of the capitol is midtown, half a mile beneath the capitol is the foundations of the capitol, the remains of the original capitol, and lowtown. Lowtown is the society of poor that has formed in the foundations of the capitol. Hidden in the lower levels, a shrine dedicated to the Cult of Rassilon the Vampire. The 53 story communications tower is in Sector 7, just outside the capitol. the area around the capitol is a desert that stretches to the horizon. The Kasterborus Borealis can be seen from the capitol, as can Mount Cadon. Buried underground are fallout shelters. Olyesti is one of the three minute cities in the east. Transduction barriers separate Gallifrey's continuity and history from the rest of the universe by locating it in a micro-universe outside of time. Thus, when you are on Gallifrey, you are outside of the universe. In addition to this, its past is protected by powerful temporal baffels, temporal locks, and governing circuits built into all Gallifreyan time travel technology. The barrier was breached once by the Sontarans when it was sabotaged from within. The transduction barriers shift the planet outside of the space time continuum and into its own microuniverse of inner time. The barriers are a 10 dimensonal defense field that can prevent enerything from atomic sized infiltrations to spaceship landings. They also allow their primary star's sunlight and gravity to reach them, but block all weapons fire or kamikaze runs. The Lord President's Rassilon Imprimatur and presidential code allow him and his TARDIS to pass through the transduction barrier at will. When a timeship passes through the transduction barriers, the effect is visible from Gallifrey's surface. Despite being in inner time, Gallifrey is still linked via a real-time analogue to its former location in the web of time. The structure of the whole planet of Gallifrey became a bio-system in which biodata acts as a planet sized receiver and processor of data from the rest of the universe. The Time Lords used it to map out every inch of the universe and define the rational laws upon which it functions. Gallifreyan seconds, minutes, days, and years are indentical to the ones used on Earth. A Gallifreyan month is probably equal to 27 days. Gallifrey time is told in 18 hour days; 9 hours of daylight and 9 hours of night. They also use micro-spans: nano-span (2 seconds); micro-span (200 sec/3.3 min); milli-span (55.6 hours/2.3 days); centi-span (23 days); span (6.3 years); kilo-span (6341 years). Old high Gallifreyan had 10,000,000 letters in its alphabet, and worked well as code for computer programs. The modern Gallifreyan omegabet has only 1,000,000 characters. Messages are writen in equations that must be solved to be deciphered. This half writing, half math language is very precise, but not very practical. Gallifreyans use 208 language tenses, have 30 different words to describe culture shock, and the plural of TARDIS is still debated by Time Lords. Gallifreyan Morse is similar to Morse Code. Creation of the Web of Time. The thirteenth night. Gallifreyan cults practice Mimesis. Otherstide Othermass Restival of Freedom. Otherstide is a holiday on Gallifrey. No one leaves their houses on Otherstide Eve and gifts are given to time-tots. Day 205: May 12 Death of Omega. The festival of the Timewright Anmers-Tonastide, or, Timeworker Feast of Omega, and Rassilon's Flag Day are other holidays. This page was last edited on 8 September 2017, at 09:35.